Posted on May 18, 2015 | Comments Off on Did Queen Victoria really die in the Kaiser’s arms? I realize it’s in dubious taste to recall Queen Victoria’s death on the day we are celebrating her birth. But I cannot resist using this occasion to cast doubt on the absurd legend that the Queen died in the Kaiser’s arms. He seems to have claimed this several times but I have seen no proof. Also, there is no evidence that he really was her favorite grandson. “Early in the morning of January 19, 1901, Queen Victoria seemed to rally. She asked Dr. Reid if she were better, to which he assured her that she was. However, very soon thereafter, she again slipped out of consciousness. It had become obvious to Dr. Reid that Queen Victoria was dying. He summoned her children and grandchildren. At 6:30 p.m. on January 22, Queen Victoria died, surrounded by her family, at the Osborne House on the Isle of Wight. 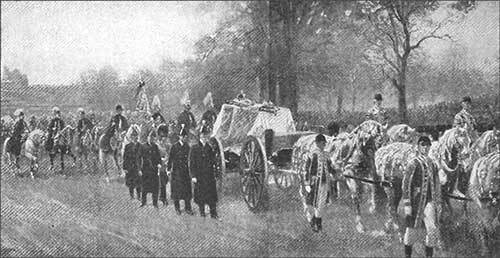 Queen Victoria had left very detailed instructions as to how she wanted her funeral. This included very specific things she wanted inside her coffin. Many of the items were from her beloved husband, Albert, who had died 40 years earlier, in 1861. Comments Off on Did Queen Victoria really die in the Kaiser’s arms? Chancellor Angela Merkel has one thing in common with Otto von Bismarck. She dominates European politics. But what a difference!­ Would she have said, as her predecessor did, “The great questions of the day will be decided by blood and iron”? Beginning in the revolutionary year 1848, the many elements that made up Germany could have proceeded towards unification along liberal democratic lines, or in a conservative militaristic spirit under the leadership of Prussia. The wrong path was taken. Thanks to Bismarck’s unique political gifts, unification, when it came in 1871, was achieved after the third military victory in wars he had provoked – against Denmark, Austria, France. The Second Reich he created became conservative and militaristic. Its constitution was non-democratic. When he spoke in the Reichstag, he invariably wore a uniform. Bismarck was a giant. His gifts consisted of single-mindedness, high intelligence, a masterful grasp of strategy, an intuitive understanding of the psychology of his opponents, and a low opinion of mankind. It is one of the ironies of history that he introduced health, old age and disability insurance, the building stones of the modern welfare state. He did it not for any humanitarian reasons but to defang his socialist opposition. After having achieved unification, he governed Germany for nearly another twenty years, making every effort to avoid war, seeing to it that Germany had good relations with Russia and resisting the temptation to acquire colonies in competition with England and France. He was unable to see that the non-democratic Germany he created could only survive in the long run if it was governed with his skills. Once the country was under the control of the young, brash, theatrical Kaiser Wilhelm II, who thought he could do without Bismarck and who had none of his talents, the road was downhill all the way. The person ultimately responsible for the disaster was Bismarck, not the Kaiser who eventually turned out to be a mere tool of the general staff. 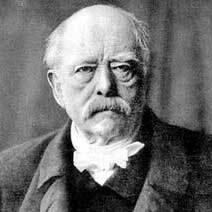 It was Bismarck who had laid the ground for the catastrophe.